This Quay nautical style outdoor wall light in polished aluminium and rated IP44 features a downward facing cage and industrial dockside charm. Circular wall mount and downward facing cage, with internal clear storm glass shade containing a bare lamp. Ideal for use with an energy efficient vintage filament LED bulb (not supplied) but can be purchased separately by following this link. Add a little bit of nautical charm to your outdoor lighting with this exterior light. The industrial design is enhanced by the use of polished aluminium, storm cage design and clear glass, which allows the bare lamp to show through. 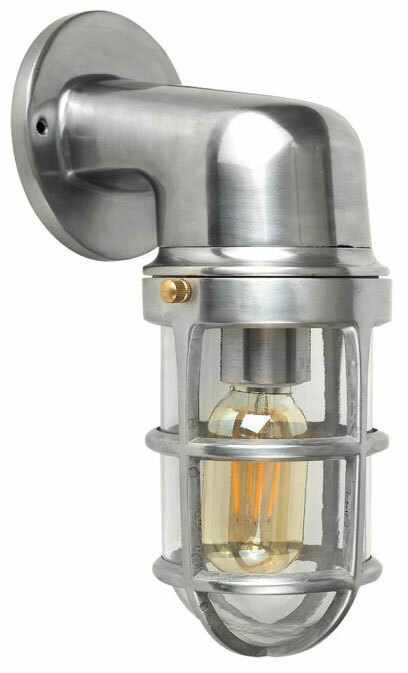 If you are searching for quality outdoor lighting in a nautical style, this fitting should be considered.